(a) No person may drive a motor vehicle unless it has a device which effectively reduces the wheel spray or splash of water or other substance to the rear of the vehicle. 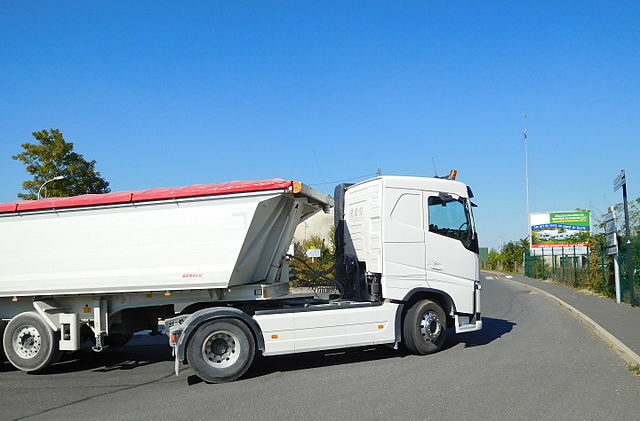 (b) The device required in (a) of this section must be installed and maintained so that the device placed behind a wheel extends downward to a distance of 14 inches from the surface of the ground when the vehicle is standing on level ground. The description in b) make it appear that it applies only to large vehicles. A regular passenger car or SUV usually does not have a ground clearance of 14 inches from the surface. My question is: Does this law apply to passenger cars/SUVs or large trucks? 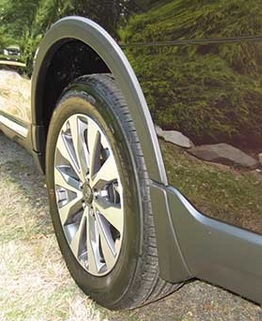 And if it applies to passenger cars, do built in "mud flaps" such as those on Subaru Outbacks (see pic) qualify? I used to live in Washington state. There are similar regulations there. As Charlie says in his comment this is "legalese for mud flaps"
For passenger cars it is integral to the cars design. 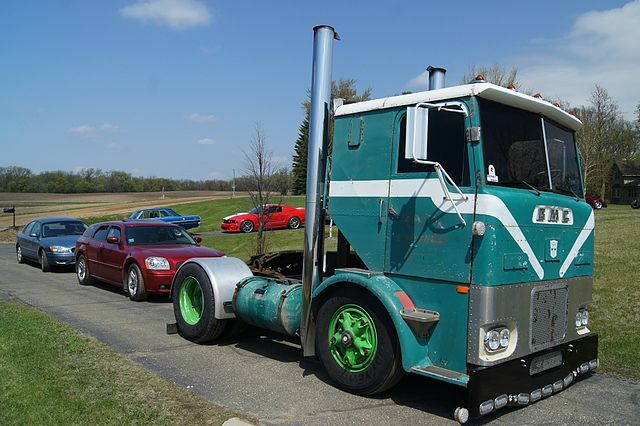 Think about a logging truck or semi without a trailer. All those large tires (eight+) on a wet rainy and/or muddy road. The truck is in front of you and there is no mud flaps nor anything over the top of the tires. A large plume of dirty water flying off the tires (Rooster Tail), with the occasional piece of gravel. That is what the law is intended to prevent. You may also see it on 4 wheel drive trucks with over size tires, where the tire extends wider then the truck body. This video starts with a pace car (sports car) driving in the rain. The rain kicked up stays relatively low and dispersed. Starting at about 1:12 in the video a you see formula 1 race cars driving in the same conditions with rain kicked up much higher. The Alaska law of 14 inches is actually not very restrictive. In many other locations it must come much closer to the ground and cover more then just the back as in these images. As for your vehicle it is fine just like it is. There are some after market larger mud guards available (example:2018 Subaru Outback MudFlaps) if you are going to be doing a lot of dirt road travel they may help keep your vehicle a bit cleaner and limit rock marks in your paint. But they are optional not a legal requirement, beyond what you have from the factory. Not the answer you're looking for? Browse other questions tagged travelling alaska or ask your own question.